The lack of a physical store does not equate to the lack of importance for visual merchandising. If anything, it is twice as imperative as you are making up for the lack of physical touch for consumers when browsing through your website. The first step to creating an ideal online shopping experience is to ensure your website is seamless and easy to navigate through. Nothing drives away online shoppers faster than a frustrating website. It is important to establish a strong homepage as it is the first point of contact when your customer reaches your website. The hero image is usually located on the first panel of the website. 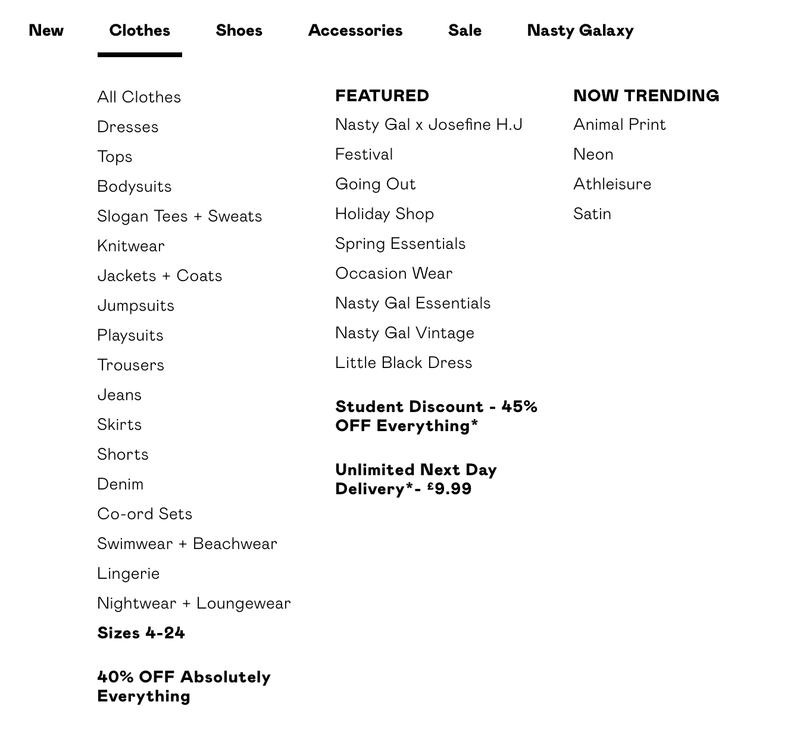 This is where you can feature new arrivals or a sale. This image should be visually engaging and impactful as it will set the tone of how the entire website. If you offer various product category, it is important to categorise your navigation accordingly. The typical categories for a clothing store would be Women’s, Mens, Shoes and Accessories. Under each category, create a drop-down menu to specify things further such as bags, jewellery and hats under Accessories. If you often run a sales or promotional campaign, you can create another navigation item for it. You can even highlight it in a different colour to make it stand out. The same concept applies to new-in items. A quick way to tie in a new assortment to a seasonal event is to create a “focused collection”, where you can group a mix of products that follow a certain theme. 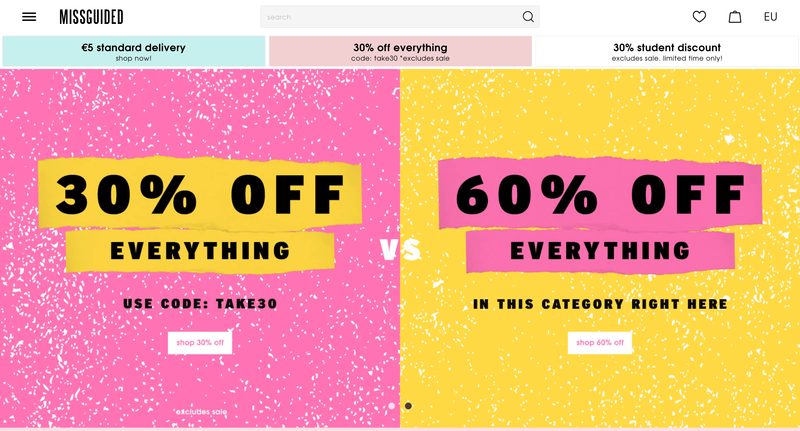 Fast fashion retailers such as Missguided or Boohoo often deploy this tactic to push certain products, such as the “festival” collection or “Valentines’” collection. To get your customers to find what they want faster, you can sort by fit, occasions, trends or brands. Most brands now integrate Instagram into their website as Instagram plays a huge role in their marketing strategies. The Instashop feature allows customers to shop on your Instagram feed itself. They will then be directed to a checkout page on your website after clicking through. Besides your homepage, your product pages should be engaging too. This includes setting the right product placement and writing catchy taglines. Most websites make the mistake of jumbling all of their products together. This practice isn’t visually appealing, as it looks heavily cluttered. Instead, spend a few hours to plot how your products can be paired with each other. Boohoo is a prime example. Here, the brand has carefully curated each product to be placed next to each other. The printed green dresses are on the far end, while the green wrap dresses are sandwiched between the anomaly. This coherent flow visually engages a customer. Even if the products are different, you can still find a way to mix and match them. For example, under Accessories, there are a variety of products. What Boohoo did here was put the belt images in threes, set in between two models featuring different products. Even if the products are different (earrings vs. a bag), the customer won’t be turned off because the visuals are coherent. There are instances where you can be creative, especially when launching a new product or guiding a user to purchase items that are hard to find the right size for, like jeans. 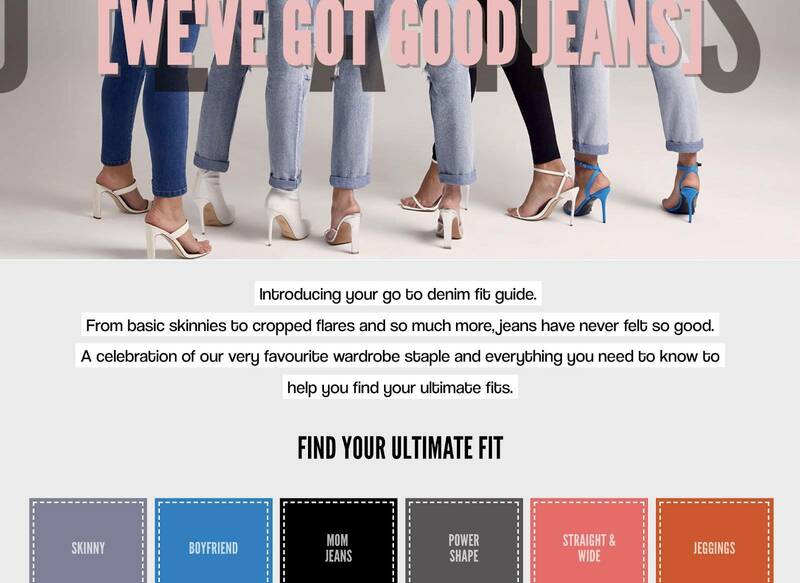 For example, Boohoo uploaded a ‘fit guide’ for customers and they can click through each box below to find carefully curated products. Your product page should encompass all the details a customer would want to know before they buy it. Information such as product descriptions, colours, sizes and reviews. Secondary information such as fabric composition and delivery details should also be accessible on each product page.